“The abstract painting grants the possibility to maximally approach reality, to get to the reality of things, understand the importance of all that’s important, which we can’t take in with our five senses… I sensed modernity as the sum total of the dramatic accomplishments, psychological tensions, intellectual oversaturation. I tried and am trying, based on what we have lived through and experienced, to create a painting form, suitable to the spirit of the times and the psychology of the century…” (Lev Kropivnitsky, 1965). Lev Yevgenyvich Kropivnitsky was born to Yevgeny Kropivnitsky and Olga Potapova. He attempted his first abstract works in the mid-1950s. 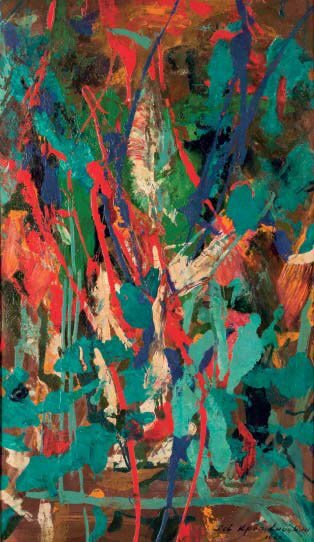 A series of exhibitions of contemporary western art, which took place in Moscow in the late 1950s and early 1960s inspired Yevgeny Kropivintsky to introspection and experimentation with abstract painting. By his own admission, Polluck’s work was his greatest influence. 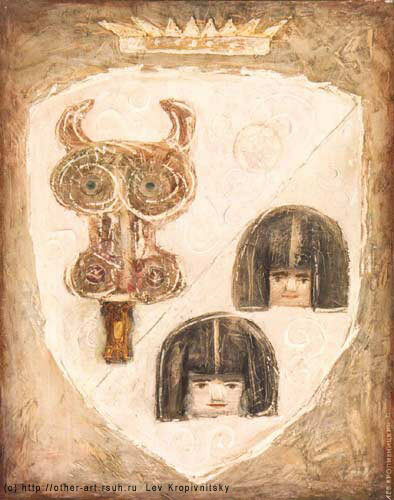 From the late 1950s he was an active member of the Lianozovsky group, which brought together artists and poets. In the 1970s he crossed over from abstract art to a new system of figurative art with elements from mythological expressionism and surrealism. 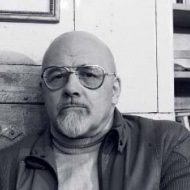 He often devotes himself to literary illustrations, creating graphics for A. Solzhenitsyn’s “One Day in the Life of Ivan Denisovich”, organized collections of poetry by G. Sapgir and N. Marin, and writes poetry and articles on art criticism. In the 1980s he returned to active work on his paintings (the period of romantic expressionism), etchings (the series “Stenograms from dreams,” “The Caprices of the Subconscious”), designing and publishing a book of poetry “Winter Comfort” (1989) and “Caprices of the Subconscious” (1990), the author’s almanac “Mansadr” (1992-1993).